Côte-Rôtie, one of the most remarkable appellations in the Northern Rhône region, is famous for its wines made from syrah, grown on a steep and sunny hill, very often with a splash of viognier. Or are they? Some producers are advocating that Côte-Rôtie’s greatness, historically speaking, may have come from a little-known grape called sérine. Its origin and identity of are surrounded by a web of contradictions, severely limited information, and in the end a fascinating story about the resurgence of a forgotten grape. 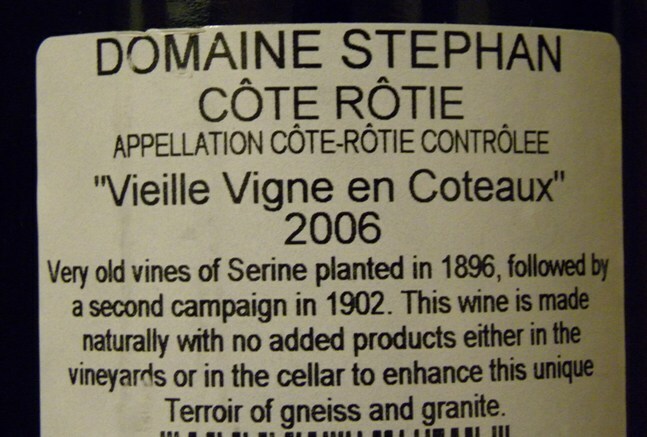 I first heard about sérine through one of my favourite Côte-Rôtie producers, Jean-Michel Stephan. 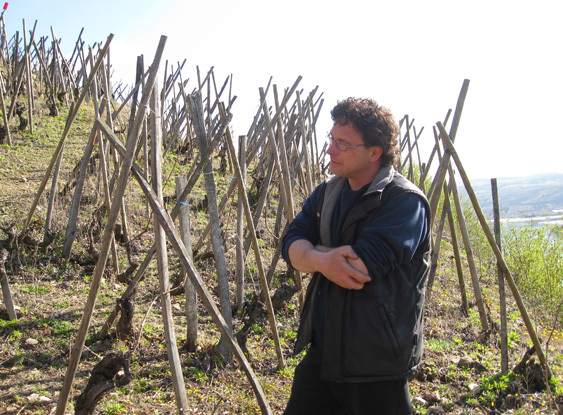 Stephan, a former assistant at the famous Rhône house, Guigal, decided to pursue his own domaine several years ago. Guided by the teachings of natural wine pioneer Jules Chauvet, he decided to cultivate organically and be as natural as possible in the winery. In this ‘natural’ spirit he also began to turn to the roots of his Côte-Rôtie terroir, something which, according to him, centers on the mysterious grape sérine. 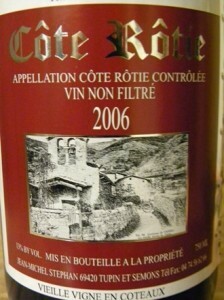 The wine that first brought sérine to my attention was Jean-Michel Stephan’s Côte-Rôtie Vielle Vigne en Coteaux. According to Stephan this wine is sourced from sérine vines planted in 1896 and 1902. Stephan is not the only one rediscovering the grape. Small, but highly respected producers such as François Villard and the Levet family are also working with it in Côte-Rôtie. Curious about this variety that I had never heard of, I went to one of my trusted sources, The Oxford Companion to Wine. I began looking under ‘S’: Serbia, Sercial, Servanin… no Sérine. On Google, the information I found at first was sparse and incomplete to say the least. It did not help that a major amino acid produced by the human body is also called serine. Most information written about the sérine grape variety presents it as being synonymous with syrah. For example, on the Côte-Rôtie appellation website it is claimed that sérine D’Ampuis and syrah de l’Hermitage are the same grape variety.On the Terroir France website Sérine is listed as a synonym of Syrah. Even ampelographer Pierre Galet in his book A Practical Ampelography: Grapevine Identification lists sérine as a synonym of syrah. Back in The Oxford Companion to Wine, sérine is not listed under syrah, but Jancis Robinson does mention that northern Rhône growers distinguish between “a small berried, superior version of syrah which they call petite syrah, and the larger berried grosse syrah.” She is also sure to point out that petite syrah should not be confused with petite sirah, which is a cross between syrah and peloursin, also known as durif and grown mainly in California. Could this petite syrah which Robinson described be sérine? 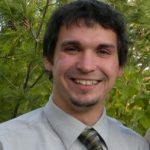 To try to resolve this conflicting story, I got in touch with John O’Neill who is in charge of product information and distribution for Jeff Welburn Selections, Jean-Michel Stephan’s United States importer. According to O’Neill, who has had several discussions about the variety with aforementioned producer Louis Barruol as well as Stephan’s export director, Christophe Mingeaud ,“it is generally agreed that over the two millennia that there have been vines planted in the region, several distinct syrah cousins developed in the various terroirs of the northern Rhône. You will find distinct differences in the syrahs of each northern Rhône appellation, if you’re comparing vineyards perpetuated with vine cuttings from the same parcels.” O’Neill went on to tell me that sérine, which has small olive-like berries and an elongated rachis compared to syrah, is likely the evolutionary result of its presence on Côte-Rôtie’s unique granite soils and steep slopes. O’Neill points out two fundamental factors that led the decline of sérine starting in the early 20th Century. The first was that homogenous syrah cuttings propagated by nurseries offered higher yields. Secondly, these nursery cuttings were also more resistant to disease, a sentiment shared by Barruol in Andrew Jefford’s book. It seems that sérine is so prone to disease that it has to be replanted quite frequently, every 30 years or so (unless you’re very lucky like Stephan). This trait, combined with lower yields, means that very few growers could justify growing it. Eventually nurseries stopped propagating the variety and replaced it with syrah. Much of the confusion surrounding sérine may also hav come about through the worldwide distribution of syrah cuttings by nurseries, especially in the late 19th and early 20th Centuries. In his piece Petite Sirah, Petite Syrah, Syrah, Shiraz, Serine: There’s a Lot of Confusion and Change Out There, Master of Wine Bill Nesto argues that Californians brought back cuttings of sérine from the northern Rhône to plant. 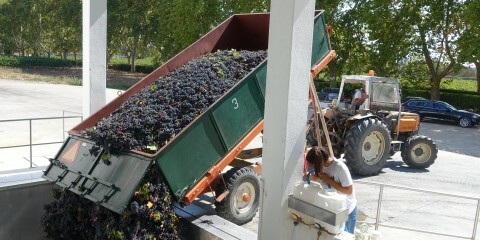 At the same time they were also planting durif, peloursin and syrah. Unfortunately, due to a lack of record keeping, durif, peloursin and sérine all became grouped under the generic title known today as petite sirah. Nesto claims that most petite sirah planted in Califorinia is durif, but a small amount may still be sérine, if it hasn’t been ripped out and replaced. From my research I’ve come to the conclusion that syrah is not the same as sérine, although they are related. It is possible that sérine and syrah came from the same ancient variety. However, over 2000 years on the slopes of Côte-Rôtie, sérine developed its own varietal identity. It is still a grape of great rarity, due the challenges it creates for growers. However, it could be argued that this is the grape variety that Côte-Rôtie built its reputation on. Thanks to ­­growers such as Stephan, Villard and Levet it is being brought back from near extinction. It deserves to keep going. After growing on that ‘roasted slope’ for so long, sérine is not synonymous with syrah. 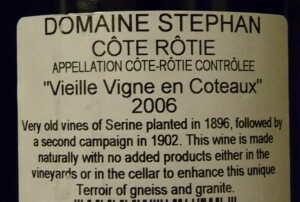 Rather, sérine is synonymous with Côte-Rôtie. Thanks so much, I am really glad you enjoyed the article. Also thanks to all those who have shared their positive comments about my piece on Twitter. I am so glad that my writing has been well received. Outstanding work on a murky subject. JMS’s wines were instantly among my favorite, and only later did I read that I was drinking Serine in his Coteaux du Taupin. The next step is to join the crews during harvest and document berry size with good comparative photographs, tasting, tannin evaluation, etc. Thanks for a marvelous posting! I quite enjoyed reading it, you will be a great author.I will always bookmark your blog and definitely will come back very soon. 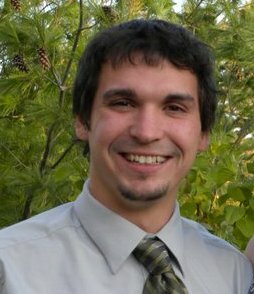 I want to encourage one to continue your great posts, have a nice holiday weekend!